Welcome to Schomberg United Church, where you will discover a friendly and supportive community of warm, welcoming families and individuals. We are friends and neighbours, committed to helping those in need, within Schomberg and in the world beyond. We hope you will explore our web site and join us for a concert, outreach event, or our church services. 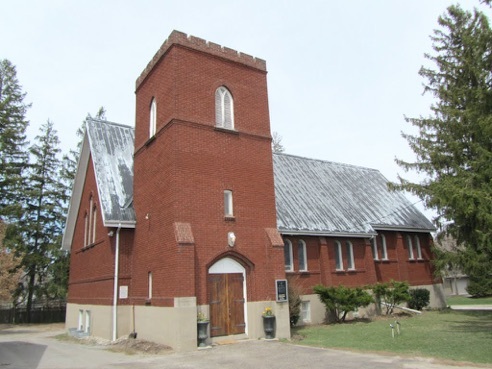 Schomberg United’s worship service is at St. Mary’s Magdalene Church, 116 Church St. at 9:30 am. This Sunday Sept. 30, the service will be based on some stories from Exodus 14:5-7, 10-14, 21-29 about Moses leading his people to freedom from the Pharaoh of Egypt and their escape through the Red Sea. The message by Rev. Carol-Ann Chapman relates the biblical story to everyday life today. Do you like to sing? Come and join the joint Nobleton-Schomberg choir, called The Joyful Spirits, on Wednesdays on 7 pm to 8:15 pm at Nobleton United. Sunday Oct. 7, Baptism at Kitchen Breedon Manor at 9:30 am. This is also World Communion Sunday. Sunday Oct. 14, at 11:15 am. Joint Service with Nobleton United to celebrate their 122nd Anniversary at Nobleton. Erika DaCunha is the special guest soloist with 3 songs. The Joyful Spirits will also sing. Light lunch afterwards. Tuesday Oct. 16, the very popular Senior’s lunch at noon at St. Mary’s Magdalene Church, lower level. Chicken main course followed by dessert. The entertainment will be Rev. Carol-Ann Chapman’s travelogue on her August trip to Europe. Call Sheila Kelly at 905-939-2315, as they have limited space. Please enter from the rear for easy access. There is no fixed charge for the lunch but donations to defray the costs are gratefully accepted. Tuesday Nov. 20, Senior’s Lunch. The entertainment will be Sentimental Journey, with singing and guitar, drums, piano. Schomberg United meets at St. Mary Magdalene, 116 Church St., at 9:30 AM most Sundays, but at the Kitchen Breedon Manor usually on the first Sunday of the month. For more info, visit nobletonunitedchurch.com and click on the Schomberg United link, or call 905-859-3976. Messages are picked up regularly. 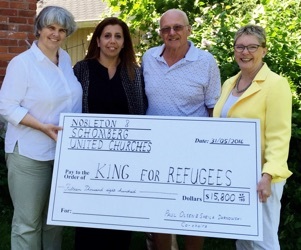 Nobleton and Schomberg United Churches presented King for Refugees (KfR) $15,800 to help sponsor their next Syrian family, which hopefully will be coming in September. Shown are (l to r): Ann Raney (head of KfR); Dima Berchalli (KfR internal communications); Paul Olsen, Chair of Nobleton United Church; Terry Turner (KfR finance). Absent from photo was Sheila Darnowski, Chair of Schomberg United Church.